At this special networking and discussion event at Scribner's Catskill Lodge, we'll meet to enjoy the beauty of this high-design inn and chat about the evolution of Greene County. Attendees at our Conversations series range from community leaders and business owners to artists and creatives making a living throughout the region. We, at Luminary have found that the intersection of makers and civic leaders is where change begins; and Greene County certainly seems to be riding a new wave of upstart businesses and an influx of full-time residents. Following some mixing and mingling—where we'll enjoy flavors from Scribner's culinary and mixology teams—Chronogram's longtime editorial director, Brian K. Mahoney, will moderate a discussion with our panel of prominent community figures on the growing culture of success in Greene County. This mix of voices will open up the dialogue around a number of regional issues—and then all attendees will be encouraged to join the Conversation. Marc Chodock is an entrepreneur and investor splitting his time between New York City and the Catskills. Born and raised in South Bend, Indiana, Marc did his undergrad at the University of Pennsylvania before moving to New York City to work for McKinsey & Company. Two years later, he began his investing career focusing on distressed businesses. During the financial crisis Marc began independently investing in real estate and hospitality companies. In late 2015, Marc led a group of investors to purchase and create Scribner's Catskill Lodge, where he is now a managing partner. Jeff Friedman has been President/Executive Director of the Greene County Chamber of Commerce since February 2013. A full time resident of Greene County since 1985, he and his wife Cynthia raised their three children in the Town of Hunter. With a background in business, Jeff served as the Vice President of Hunter Mountain Ski Bowl and Managing Director of Hunter Mountain Festivals from 1985 until 2006. During his time at the Chamber, Jeff has made it an emphasis to assist and bring attention to the services and needs of numerous local not-for-profit community organizations. Sarah Slutsky was born and raised in Hunter, where she worked for her family's business, Hunter Mountain, throughout her teenage years. After graduating with a degree in Business Management & Marketing from Ithaca College, Sarah returned home to work for the family business first at The Kaatskill Mountain Club, then as the Resort Services Manager for the ski area. Last summer, Sarah and her husband, Philip DiFalco opened a rustic restaurant in Tannersville called Jessie's Harvest House Restaurant & Lodge. Brian Wagner is a hospitality professional with over 25 years of experience in the industry. Brian moved to New York City from a small mountain town in West Virginia in 1996 and spent the following two decades managing nightclubs, restaurants, and F&B departments before climbing back into the hills to find a new home in the Catskills. His resume includes The Park, The Maritime, The Bowery Hotel, The Jane Hotel, East Side Social Club, The Westway, Le Baron, Soho Grand, and now Deer Mountain Inn in Tannersville. When he’s not working at DMI he’s busy attempting to rediscover all the country boy hobbies he abandoned on the subways. Jessica Walsh, proprietor of Circle W Market, is a Greene County native, born and raised in Catskill, NY. Jessica’s strong local roots and her years spent as a Social Worker inspire her to not only oversee the everyday tasks of owning a general store but to build community in and around the hamlet of Palenville. Space is limited. Get your tickets here. 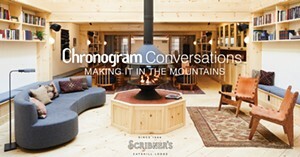 Chronogram Conversations are made possible through sponsorship support by local companies and organizations. Contact us to explore how your organization can participate in speaking to tens of thousands of local readers and attendees as an underwriter of our next Chronogram Conversations event. Chronogram Conversations – Sustainable Entrepreneurship in the Hudson Valley - Rhinebeck, N.Y. May 8, 2018 from Luminary Media on Vimeo.